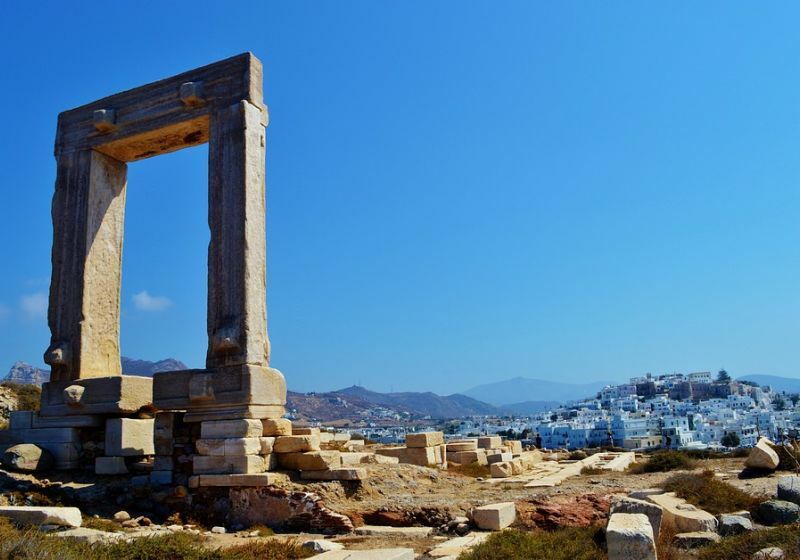 Naxos is the largest and the most self-sufficient Cycladic island. It is worth a visit for several reasons, such as swimming in its famous sandy beaches, visiting some of the most important Aegean monuments like the Portara, and the huge status of Kouros, walking into town and the beautiful villages, tasting delicious food made by local raw materials in the village square or next to the sea. Adrenaline goes up when you visit the island’s beautiful beaches. The coastline of Naxos’ west region which is a vast sandy beach of many kilometers, is awarded constantly. The beaches of Agios Georgios, Agios Prokopios, Agia Anna, Plaka, Orkos, Mikri Vigla are well-known for their beach bars and the water sports. The rest of the island has quiet beaches, especially those which are located around the Cape Kouroupia with dunes and cedar trees. Discover the castle of Naxos Chora. Apart from the tourist attraction of the port of Naxos, you should walk through the old market streets of Burgos, with its elegant shops, and look out for the “Trani Porta” or the “two Paraportia” that will drive you into the castle. Beautiful buildings with Venetian coats of arms and ancient architectural signs remind that the Duchy of the Archipelago which was founded by Marco Sanudo in the 13th century , centered in Naxos. If you are interested in that era, you need to pass by the Venetian Museum, but don’t forget to make your way to Portara, the Naxos trademark, in time for beautiful sunset. Fall in love with the traditional Cycladic villages. Apiranthos and Koronos, the most beautiful villages of Naxos , are both amongst those villages who led the export of the famous Naxian emery. There is no doubt that Apiranthos is the most famous villages of the Cyclades with white houses, marble paved “rymnes”, marble doorways and impressive “stiasta” which can keep your interest alive for such a long time, pushing you to discover the secrets and traditions of the locals. At Koronos you will find out more about the emery and the locals’s life in the mines. If you have any chance an inhabitant will accompany you in the galleries. The best way to finish the journey, is to drink ouzo under the trees in Moutsouna area. Try traditional products. A good reason to visit Naxos is their local production. The inhabitants continue to cultivate the land, raise animals and prepare exquisite products. From the famous Naxos potatoes and fine meats in Filoti to the famous graviera cheese, ricotta, cream cheese (sour and sweet), touloumotyri, xygalo etc. either produced in humble small farms in Zas mountain or in modern dairies, Naxos remains self-sufficient. Naxos supplies many shops and markets in Greece with its products such as fine wines produced in local vineyards, and fresh vegetables. “Naxos Kitro” the famous local drink produced with care at the distillery of Vallindras in Halki, is one more example of what they are able to do. Discover Byzantine churches. It is the secret of the island, as more than 100 Byzantine churches with frescoes are recorded in Naxos. The impressive however is that the wall painting never stopped existing, it began in the early Christian period and lasts until the 13th century! Successive works of paintings that include symbolic designs of the era of iconoclasm make the archaeologists talk about “the phenomenon Naxos" and "Byzantine icon painting gallery." If you take a look at Panagia Drosiani Moni, Panagia Protothroni in Halki, St. Kyriaki Apiranthos and St. George Diasoritis, just outside Halki, you will see the biggest part of the religious inheritance. In Halki you will be seduced by its cozy atmosphere, the old classical buildings and chic shops for coffee and dessert (spend time at Dolce Vita and taste the galaktomboureko (milk tart) at Galani’s shop).